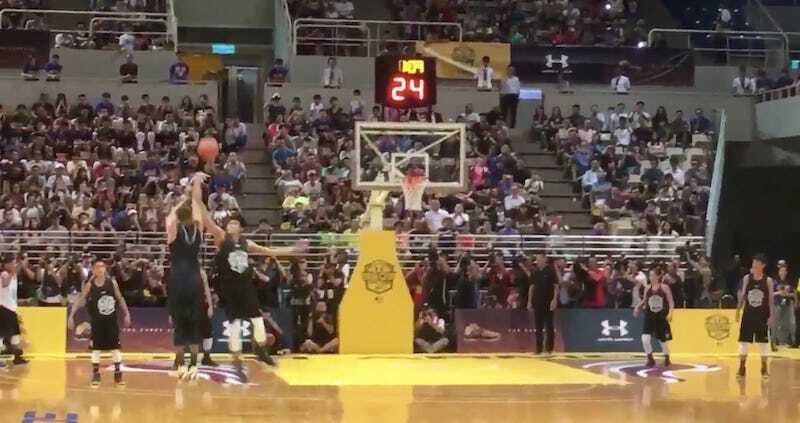 Steph Curry’s summer of defeats continued Tuesday at an event in Taiwan when a 17-year-old blocked the Golden State Warrior’s shot. Filipino Gian Mamuyac, who played for the country’s U18 team this year, stifled Curry with his sound defense, just like Kevin Love did in Game 7 of the NBA Finals. Unlike the situation in the playoffs, in which Curry’s shot missed, this ball didn’t even make it to the rim. For his efforts, Mamuyac earned a trip to Curry’s camp in the United States. Update (6:03 p.m.): Someone in the crowd, not Curry, asked for the replay, according to TJ Manotoc. Can’t replay Game 7, though.